I feel like a Volkswagen, like Herbie the Love Bug, in a field of Ferraris. 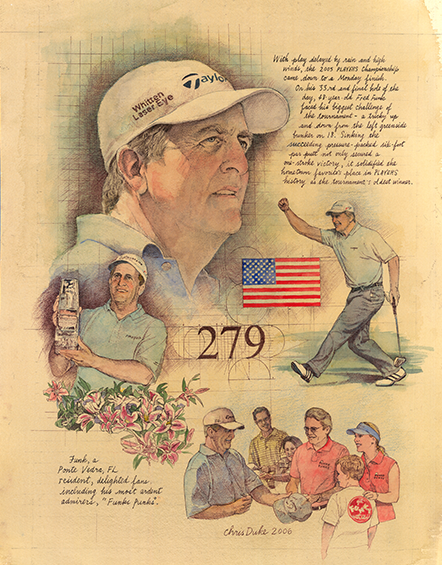 Never did he reject notions that he was “the little engine that could.” Fred Funk just couldn’t ignore his history. Cut from his collegiate team at Maryland, he went to a community college to hone his game, then returned to make the Terrapin squad two years later. As a pro, he persevered and at 33 made it onto the PGA TOUR. So at THE PLAYERS Championship 2005, Funk put an exclamation point on his underdog status when he looked up and down the lineup at the best and deepest field in golf. Funny stuff, only when it came to the proceedings at THE PLAYERS Stadium Course at TPC Sawgrass, Funk was all business as his Volkswagen outraced a fleet of Ferraris in some of the most demanding weather seen at the Stadium Course. Inspiring enough was Funk’s win from four behind Luke Donald to start the final round. It was even more so considering that at 48 he became the oldest winner of THE PLAYERS even while playing 32 holes Monday thanks to big weather delays. Funk’s fourth-round 71 came on a day when the field average was 76.512. He birdied the par-5 16th to seize the lead, then made a 5-foot putt to save par at 18 and secure a one-stroke win over Donald (76), Scott Verplank (70) and Tom Lehman (66).